Background: The seasonal, managed marshes in this flat, alkali grassland draw northern pintails, redheads, teal, canvasbacks, grebes-nearly every species of dabbling duck and many diving ducks. Snowy egrets wade near tules and cattails that camouglage American bitterns and Virginia rails. Ring-billed gulls mix amoung scores of shorebirds, warblers, swallows, sparrows, and other songbirds perch amoung marsh plants. A half-dozen species of birds of prey watch marsh activity from aloft, including peregrine falcons. Artifical dens have been built for endangered San Joaquin Kit Foxes as well as Burrowing Owls. The San Joaquin Kit Fox is an endangered species native to the region and is included on the list of species for the Central Valley Project. Visitors are able to get an idea of the historic wetlands which once dominated the landscape. The Habitat: Habitats on the Refuge are broken down into the following catagories: Uplands (grasslands, alkali playa, and valey sink scrub) make up 38% of the Refuge land base, seasonal marsh and moist soil units makes up 40%, and riparian habitat makes up less than 2%. The remaining acreage is comprised of roads and other infastructure. The Experience: The Refuge is the largest wetland area in the Southern San Joaquin Valley and plays a vital role in the Pacific Flyway for migrating waterfowl, shorebirds, and songbirds. 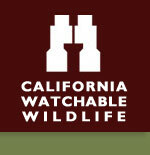 Wildlife and Where to Find It: Wildlife viewing is done from car and levee roads. Viewing Tips: The best time for viewing birds, particularly waterfowl, is during the fall and winter months, October through March, when water is plentiful in the ponds. Late spring to early summer is a good time to view reptiles and other songbirds. Waterfowl hunting season is October - January, Wednesday and Saturday, closing Auto Route #1 on those days. Auto Route #2 remains open year-round. Site Notes: The Refuge hosts up to 50,000 waterfowl annually. Viewing opportunities of large flocks of northern pintail ducks allows the visitor an overall appreciation of the strategic placement of the Refuge in the Southern San Joaquin Valley. Nearby Viewing Sites: All other areas open to the public are located further than 10 miles but under 25 miles. They include Pixley NWR and Allensworth State Historic Park. Festivals & Events: The site is a venue during the Kern Preserve Bio-Regions Festival and annual Christmas bird counts. Seasonal: The Refuge has a waterfowl hunt program from October to January each year. Hunting occurs on Wednesdays and Saturdays only when the Refuge is closed to other forms of recreation. Road Hazards: Roads may become soft when wet. Parking Danger: The roads, especially the shoulders, can become soft during wet weather. How to Get There: From Interstate 5, exit at State Highway 46 and drive east for 4 miles. Turn north on Corcoran Road and drive 10.6 miles to the Refuge which is at the intersection of Garces Highway and Corcoran Road. From Delano, exit at Garces Highway and drive east for 19 miles to the Refuge.